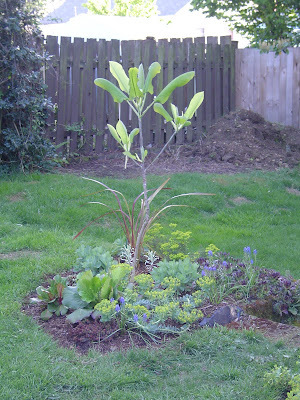 Inspired by running across the above picture of Clifford (our big leaved Magnolia), taken in May of 2006, I thought it would be fun to do a week long series of “then and now” posts, highlighting a certain part of our ever evolving garden. So, I’m declaring this “then and now” week in the danger garden. Of course if any of you are inspired to put together a couple of your own “then and now” posts I’d love to see how your gardens have changed over the months and years. Here is roughly the same shot as above, taken the day of our home-inspection, before we bought the house, in May of 2005. Yikes! There were roses in the garden then! We moved in the end of June 2005 and I think one of the first things I did was get rid of them, and the daisies. 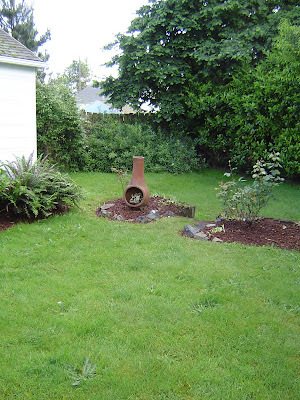 April 2007, the back yard has been totally neglected while we concentrated our efforts out front. It’s a sad sight. Look how FAR this garden has come!!! That is so thrilling to see ... that last image is a stunner. The space has gone from just a yard to a totally useful, beautiful, interesting place to be. I LOVE IT!!! It's funny, we both started with roses in our yards. I had no idea what to do with those - I didn't even like them, but I thought I should figure out how not to kill them. Then, when I learned enough about gardening to keep them alive I also learned how problematic they were and out they went. I developed my love for spikes and spears and never looked back! Just like you! Wow, Loree! This is so dramatic! 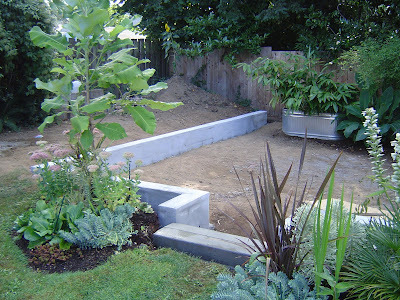 In some ways, I think the most amazing transformation is the geometric one: how you took soft rounded beds (and plants) and made them so linear and focused alongside your patio and walkways. It's something I started out trying to do, but failed: I ended up curving lots of the beds for more room. It takes a lot of discipline - something you clearly have. I really like the way you have edged your beds using blocks and hardscape. It adds a lot to the precision of your overall design. It must be so satisfying to see it all come together the way it has: I've enjoyed it in person, but I'm appreciating it all over again seeing the background work you put in. Great job! Wow! 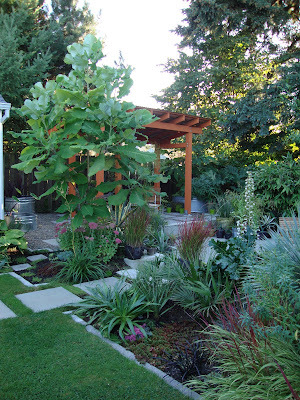 There's nothing like before and after comparisons to show yourself (and others) how far your garden has come. That last shot looks like something out of a garden magazine. If I can find the time, I may join in with you this week. The new-baby garden is one year old now, a toddler I suppose, and I've been wanting to look back and compare the changes. Oh my!! I thought that that Danger Garden was amazing before I saw what it used to look like. Now - I'm speechless! Nice work! The before/after concept is really a cool one. It gives me all kinds of ideas for future posts, but now is not the time for great "after" shots, so I guess it will have to wait until next season. Your post is inspiring. Thanks! I agree with Jane, your hardscape elements are such a good element of your design, one I admire and lack the skill and discipline to imitate. I'm thinking I can't really live without a magnolia like clifford. And in three years it looks like that? How have I gone without all this time? Kicking myself. Germi, spikes and spears...I love it! That would be a great blog name! There are wild roses growing next to the freeway on-ramp that I take every night, I love those...but not in my yard. Jane, thank you! 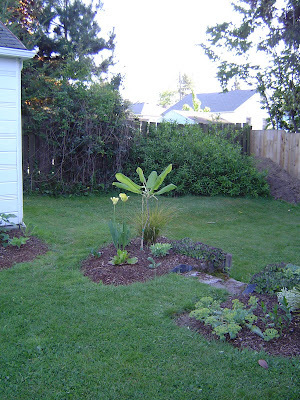 You know in looking at the "then" pictures for these posts the images of the curving beds made me a little nostalgic. But I do love the hard lines, they are more my style. Pam, it really surprised me to see how far we've came, I didn't remember how "bad" it was! And I hope you do join in! how it grows, thank you! ricki, but you could post some transition pictures...that was part of my dilemma, it's never really done is it?